LOS ANGELES -- With Kobe Bryant back on the practice court -- even if his return isn't exactly imminent -- it's time to start thinking about how this mix of Los Angeles Lakers will fit with him. We know, for instance, that Steve Blake won't duplicate the 16 assists he had Sunday night against the Pistons; he wont have the ball that much. Jordan Hill can't count on surpassing the career-high 24 points he had. But there's no reason Hill can't top the career-high 17 rebounds Sunday, especially if Kobe's shot is off when he returns. And there's no reason Nick Young can't continue to provide scoring off the bench if he's getting a good chunk of his minutes while Kobe is out of the game. The sequence is rarely as simple as "superstar returns from major injury, team plays great." The Chicago Bulls could tell you that. The question is how quickly the Lakers can adapt to him. Because, as they'd say on "The Wire": Kobe coming, yo. 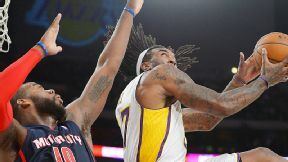 AP Photo/Mark J. Terrill Jordan Hill showed again that he can hang with the big fellows, pulling down 17 rebounds. "He's coming back along," Hill said. "I thought he wasn't going to go that hard [in practice], but he's pushing it. I know hes not ready yet, but it's coming along. He should be ready pretty soon." It probably won't happen before Thanksgiving. But December doesn't seem far-fetched. That shouldn't be a problem for Pau Gasol. After he joined the Lakers midway through the 2007-08 season they went straight to the NBA Finals and he has logged far more games with Kobe than anyone else on the Lakers' roster. It will obviously have an impact on Jodie Meeks, the starting shooting guard of late who has made about 60 percent of his shots at Staples Center. But it's Hill who has emerged as the Lakers' most important player lately, and even though he might shed that title with Kobe on the court, he shouldn't be less effective. "I think it will be the same way," Hill said. "I'm going to continue to do the things I've been doing: playing aggressive, playing hard and just going after it." That allows him to thrive even though, as Blake noted, "Nothing is designed to get him the ball." "It's not like they're throwing the ball in the post 20 times," Pistons forward Greg Monroe said. "He just made the hustle plays, ran the floor and had offensive rebounding." Hill grabbed five offensive rebounds even though the Pistons had two of the league's top 15 rebounders on the court in Monroe and Andre Drummond. He can get his baskets on putbacks and the occasional pick-and-roll passes and be content. He doesn't crave touches, he just wants playing time. "That's all I needed, was more minutes," said Hill, who came off the bench in the first eight games but has started the past four and logged 30-plus minutes in each of the past three games. "Just give me more minutes, and I'll go out there and continue to do what I've been doing." Young's arc has gone the opposite direction, from starter to reserve so he jas recalibrated his target to be Sixth Man of the Year. "I'm going for it," Young joked. "I'm telling y'all." He's averaging 16.3 points in his past four stints off the bench, including 19 Sunday night. "Either way. I've got a mindset now of trying to go in and play my game and trying to relax more and have fun out there," Young said. If he's the first substitute for Bryant, he'll still have chances to get his shots. The difficulty will be mixing Young and Meeks, as they're both thriving with separate units now. It's a reminder that Bryant's return will not necessarily make everything easier. Opposing coaches note how the ball moves better in his absence. Mike D'Antoni's system, as Blake explained, is "based off of every guy being an option on every play." Bryant will be Option 1 and Option 1A, and he prefers to do his work below the free throw line posting up his defender. That will mean fewer pick-and-roll opportunities for Hill, among other things. It also will mean having a better chance of winning on the road, where the Lakers have started 1-4. Bryant is one of the best road players in the league. "The identity is going to be: We have to play full out for 48 minutes," DAntoni said. "And then Kobe comes back and now the identity changes, so we're OK."
Some players can maintain their roles even amid a shift in team identity. Hill and Young are two good candidates. MVP: Damian Lillard. He scored the Blazers' first seven points in overtime, getting them back on the right track after they'd blown a 17-point lead in regulation. Lillard may not be the league's best sophomore (hello, Anthony Davis), but the reigning rookie of the year is still getting better. X factor: Mo Williams was brought in to help lighten Lillards minutes load. He didnt quite do that Sunday -- Lillard still played 41 minutes -- but he put up 13 points and seven assists and was a game-high plus-14 off the bench. That was ... confounding. First, Rudy Gay -- who hasn't shot better than 50 percent from the field in a game this season -- started 5-of-5. Then he missed 12 of his next 15 shots before turning into Mr. Clutch late in the fourth quarter. If the Raptors are going to be successful, they need more consistency from their top player. MVP: Mike Conley had no trouble shredding the Kings' defense. The Grizzlies' point guard finished with 19 points on 8-of-12 from the field and nine assists in 38 minutes. Kings coach Michael Malone called him one of the most underrated point guards in the NBA. X factor: Travis Outlaw came off the bench and gave the Kings a much needed spark after halftime. The veteran small forward scored all 11 of his 18 points on a perfect 3-of-3 shooting in a third period that built momentum for a Kings' comeback. Unfortunately for Sacramento, that comeback fell short. That was ... a tale of two halves: The Grizzlies mucked up the first half for the Kings, holding Sacramento to an abysmal 31.9 percent shooting from the field. But the second half was another story. Sparked by their bench, the Kings' offense came alive to shoot a respectable 45 percent. MVP: Jordan Hill put up a career-high 24 points and 17 rebounds, dominated a daunting Pistons front court, nailed three outside jumpers, and drew a Dennis Rodman comparison from James Worthy. Not too shabby. That was ... full of highlights: While Jennings' off-the-backboard lob to Andre Drummond will be the greatest takeaway from this game, Wesley Johnson's hammers in transition and Steve Blake's beautifully orchestrated lob passes should not go uncelebrated. Defining moment: Late in the third quarter, with the Lakers down two, Nick Young hit a layup and then nailed back to back 3-pointers to give the Lakers a four-point lead they would never surrender. -- David Walker, Roundball Mining Co.
Hill took down the Pistons' sizeable frontline with another impressive effort, posting career highs of 24 points and 17 rebounds in the Los Angeles Lakers' 114-99 victory over the vistors from the Motor City. John Salmons, Kings: He turns 34 in less than a month and has not made many shots this season (less than 31 percent field-goal percentage) for the rebuilding Kings, but there he was for 34 minutes Sunday, missing all four of his 3-point attempts in a 97-86 loss to the visiting Grizzlies. "I just have to be better at policing myself." -- Knicks swingman J.R. Smith, on whether he should shut down his Twitter account after earning a fine from the NBA for hostile tweets directed at Detroit's Brandon Jennings. Mark Konezny/USA TODAY Sports Damian Lillard's hot hand in overtime helped the Portland Trail Blazers earn a 118-110 win over the Toronto Raptors. Damian Lillard made all three of his field-goal attempts in overtime as the Portland Trail Blazers posted a 118110 win at the Toronto Raptors. 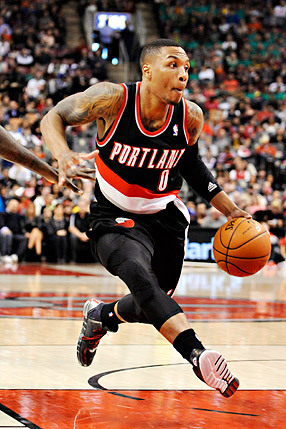 That improved Lillard's career field-goal percentage in OT to 81 percent (13-for-16).